Watermelon can be a great first finger food, because it has a soft consistency, but baby can still pick it up. It doesn't have much in it other than water, but it is great on a hot day. Look for seedless watermelon, and sometimes you can find it in containers already cut up (a great time saver!). 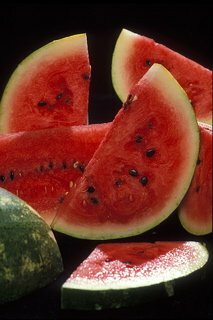 You can usually find small watermelons all year round at the grocery store, but they are really prevalent in summer. There are more than fifty varieties of watermelon ranging in size from less than a pound, to more than two hundred pounds with flesh that is red, orange, yellow, or white, so there are lots to try if you love watermelon! Look for a seedless firm watermelon or buy watermelon chunks in the salad section of your supermarket. Watermelon keeps well in its cut up state. You frequently see watermelon in mixed fruit containers at stores because it keeps so well this way. When you decide to eat it, cut all of it up and put in a container to save yourself some time. Store whole watermelon in refrigerator or on the counter. Eat chunks within a few days. No. it has a tough rind so it probably doesn't contain pesticides. Try serving this to baby too, if your baby likes cheese. Toss watermelon, feta and parsley in serving bowl and put in fridge. Do NOT serve this salad at room temperature because the feta goes soggy and the watermelon gets a strange texture. Broccoli is one of those vegetables that people love to hate. We think this is probably because most people have been fed broccoli when it isn't fresh, and it can taste quite bitter and sulfurous. But, fresh broccoli is a joy - sweet and it has a great consistency. It is good raw or fully cooked and if you can find a way to love it - it is very nutritious. When baby gets older, you can play a game where your baby thinks that the broccoli stalks are little trees and she is a big dinosaur eating them!. There are three forms of broccoli to buy. Whole broccoli, fresh broccoli florets in a plastic bag, and frozen broccoli florets. Whole broccoli needs to be chopped up and the stem can be used if you peel it. 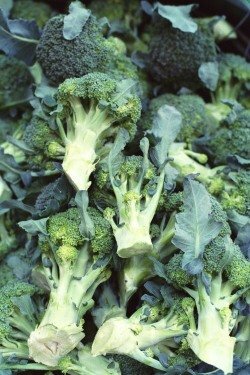 Freezing broccoli does not significantly alter the nutrient content. Simmering or microwaving broccoli are the easiest ways to prepare it. 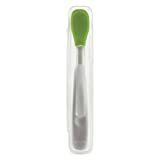 If you are using whole broccoli, cut off florets, and then peel the stem and chop. Simmering - put it in a saucepan cover with salted water, and cook on high until the thick part of the stalks can be pierced with a fork (about 8 minutes). If you are using bagged broccoli or frozen broccoli follow the directions on the package. Put in a loose plastic bag in the vegetable bin and use as soon as possible. No. It is on the list of vegetables the USDA found to contain the least amount of pesticides. Since many people don't like broccoli, we will try adding the ingredient that makes most vegetables palatable - cheese! Since cheese sauce takes a while to make and we are avoiding processed cheese, we will use parmesan. Give a little taste to the baby - she may surprise you and love it! Preheat oven to 350 F. Butter a square baking dish and put broccoli in and cover with Parmesan. Bake until parmesan is melted - about 10 minutes.